Palestinian amora of the first generation (2d and 3d cent.). A genealogical chart found at Jerusalem traced his descent from Eli (Yer. Ta'an. iv. 2; Gen. R. xcviii. 13). Yannai was very wealthy; he is said to have planted four hundred vineyards (B. B. 14a) and to have given an orchard to the public (M. Ḳ. 12b). His first residence was at Sepphoris (Yer. Ber. iv. 6 et al. ), where he seems to have held a public office, since at the death of R. Judah ha-Nasi I. (Rabbi) he gave an order that even priests might attend the funeral of the great teacher (ib. iii. 1). Halevy, however, has concluded that Yannai always lived at 'Akbarah, or 'Akbari, where he established a school (see below). Yannai was prominent both as halakist and haggadist. He was a pupil of Rabbi, in whose name he transmitted several halakic sayings (Yer. Ḥag. iii. 2; Yer. Ḳid. iii. 14; et al.). The best known of his senior fellow pupils was Ḥiyya Rabbah, who, as an assistant teacher in Rabbi's school, sometimes acted asYannai's tutor (Yer. Dem. vii. 1; Yeb. 93a). But several discussions between Ḥiyya and Yannai (Yer. Ber. iv. 5, and Babli passim) show the real relationship. Their friendship was afterward cemented by the marriage of Yannai's daughter to Ḥiyya's son Judah (Yer. Bik. iii. 3; Ket. 62b). Yannai transmitted also some halakot in the name of the council ("ḥaburah") of the last tannaim (Mak. 21b). He established an important school at 'Akbarah (Yer. 'Er. viii. 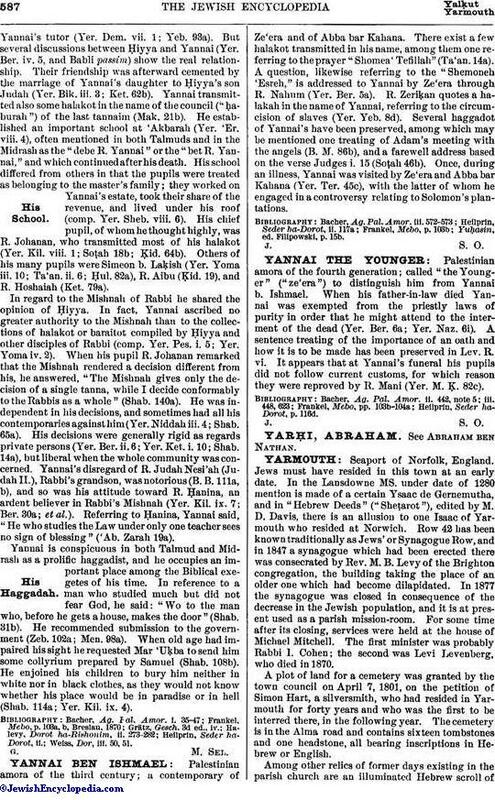 4), often mentioned in both Talmuds and in the Midrash as the "debe R. Yannai" or the "bet R. Yannai," and which continued after his death. His school differed from others in that the pupils were treated as belonging to the master's family; they worked on Yannai's estate, took their share of the revenue, and lived under his roof (comp. Yer. Sheb. viii. 6). His chief pupil, of whom he thought highly, was R. Johanan, who transmitted most of his halakot (Yer. Kil. viii. 1; Soṭah 18b; Ḳid. 64b). Others of his many pupils were Simeon b. Laḳish (Yer. Yoma iii. 10; Ta'an. ii. 6; Ḥul. 82a), R. Aibu (Ḳid. 19), and R. Hoshaiah (Ket. 79a). In regard to the Mishnah of Rabbi he shared the opinion of Ḥiyya. In fact, Yannai ascribed no greater authority to the Mishnah than to the collections of halakot or baraitot compiled by Ḥiyya and other disciples of Rabbi (comp. Yer. Pes. i. 5; Yer. Yoma iv. 2). When his pupil R. Johanan remarked that the Mishnah rendered a decision different from his, he answered, "The Mishnah gives only the decision of a single tanna, while I decide conformably to the Rabbis as a whole" (Shab. 140a). He was independent in his decisions, and sometimes had all his contemporaries against him (Yer. Niddah iii. 4; Shab. 65a). His decisions were generally rigid as regards private persons (Yer. Ber. ii. 6; Yer. Ket. i. 10; Shab. 14a), but liberal when the whole community was concerned. 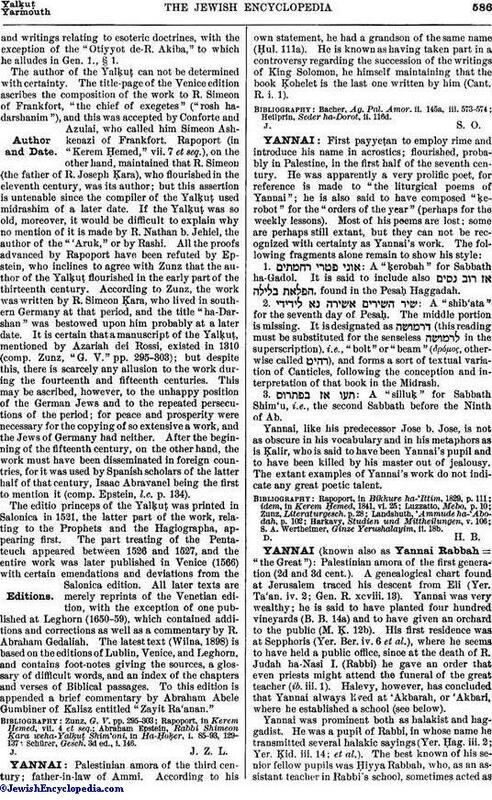 Yannai's disregard of R. Judah Nesi'ah (Judah II. ), Rabbi's grandson, was notorious (B. B. 111a, b), and so was his attitude toward R. Ḥanina, an ardent believer in Rabbi's Mishnah (Yer. Kil. ix. 7; Ber. 30a; et al.). Referring to Ḥanina, Yannai said, "He who studies the Law under only one teacher sees no sign of blessing" ('Ab. Zarah 19a). Yannai is conspicuous in both Talmud and Midrash as a prolific haggadist, and he occupies an important place among the Biblical exegetes of his time. In reference to a man who studied much but did not fear God, he said: "Wo to the man who, before he gets a house, makes the door" (Shab. 31b). He recommended submission to the government (Zeb. 102a; Men. 98a). When old age had impaired his sight he requested Mar 'Uḳba to send him some collyrium prepared by Samuel (Shab. 108b). He enjoined his children to bury him neither in white nor in black clothes, as they would not know whether his place would be in paradise or in hell (Shab. 114a; Yer. Kil. ix. 4). Weiss, Dor, iii. 50, 51.